In many remote mountainous areas in China, their development is far behind that of cities due to the geographical location. For them, tourism is an important way to develop the local economy, and many local peoples regard tourism as their primary sources of income. This case study focuses on the connection between tourism and local peoples’ rights in Huangwanxiang. Known as "the paradise of Mount Emei", Huangwanxiang is located in the scenic area. Due to the continuous reduction of the cultivated land area since 1981, traditional agriculture has been relegated to a secondary position, and the tourism service industry has become a pillar industry in the region. However, local authorities have forgotten to protect the interests of local peoples while developing tourism and protecting scenic spots, which has led to the birth of a “blocking storm” on June 23, 2014 (Guo & Chen, 2014). Although relevant policies such as special funds and pension subsidies are quickly formulated by local government, the accumulated dissatisfaction of people needs to be solved with longer-term guarantees. The relationship between tourism industry development and local people should be constantly coordinated. Huangwanxiang is located in Emeishan City, Sichuan Province. In 1997, in order to protect and manage Mount Emei, the People's Government of Huangwanxiang (Huangwan Town) was established with the approval of the People's Government of Sichuan Province. The highest altitude in the territory is 3099 meters and the lowest altitude is 465 meters. It is adjacent to Luomu Town in the south, Eshan Town in the east, Sichuan Township in the north, and Gaomiao Township in Hongya County in the west. The administrative area of ​​Huangwan Township covers an area of ​​182 square kilometers. The Mount Emei in the township was listed by the United Nations Educational, Scientific and Cultural Organization (UNESCO) in the World Natural and Cultural Heritage List in 1996. Since 2003, Huangwanxiang has actively carried out the activities of creating a “National Environment and Beautiful Township”. So far, it has completed 18,600 mu of returning farmland to forests, with a forest coverage rate of 87.9% and a soil erosion control rate of 84.17%. The number of tourists is increasing year by year, and the catering and entertainment industries are developing rapidly. There are 173 hotels and restaurants, and there are more than 4,200 tourism employees, accounting for 50% of the scenic labor force. Many tourist home-stays in Leidongping, Jinding and other places have disappeared. Huangwan Martial Arts Culture Town hold the seventh World Traditional Martial Arts Competition. The regional government has an increasing concern to the sustainable tourism development in Mount Emei Scenic Area. It is proposed that to improve the quality of tourism, it is necessary to increase some cultural connotations, and some illegal buildings in the scenic area should be managed. A group of local peoples in core scenic spots volunteered to "go downhill" – moved to other places to live. In 2017, Mount Emei Scenic Area and Emeishan City jointly issued the “Trial Measures for the Reform of Rural Property Rights System in Huangwanxiang, Mount Emei Scenic Area”, with a total investment of 480 million yuan (Ninety-six million), to guide local peoples to move out in an orderly manner. According to statistics, 3,853 people in the core scenic area volunteered to "go downhill". Undertake the protection, utilization and unified management of the Mount Emei Scenic Area and its world's natural and cultural heritage. Protect scenic resources and ecological environment, maintain the natural features and cultural landscape of scenic spots, and make rational use of scenic resources. Formulate and implement the protection measures and management system for the natural and cultural heritage of Mount Emei. Organize and assist residents of scenic spots in developing production and service businesses with local characteristics. Responsible for the sale of tickets for scenic spots, charging for the use of scenic spots and resources; organizing and responsible for the bidding and signing of the scenic spots business projects, and supervising the units and individuals operating the business according to law. Complete other tasks assigned by the municipal party committee and the municipal government. Timeline of the "Blocking Storm"
on June 23, 2014 The beginning of the "blocking storm". The unemployed “guides” (local peoples) began to consult with the Management Committee at the entrance of Wannian Temple and put forward their demands. The villagers' demands focus on nine aspects, such as "forest rights", "dividends" and "employment security", which are accumulated over the years. On the afternoon of June 28, 2014 The official website of the Mount Emei Tourism Scenic Area issued a notice. “Because of entering the flood season, there are potential safety hazards, and the Mount Emei Scenic Area has stopped receiving passengers since 13:00 on the 28th.” However, after the announcement, a number of netizens pointed out in the comments that "the closure of mountains this time has something else hidden". According to netizens, the closure may be due to local villagers' rights protection. 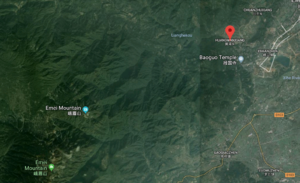 At 0:29 on June 29, 2014 The official website of Mount Emei Scenic Area announced the decision to resume the reception of tourists in the areas of Baoguo, Huangwan, Longdong, Jinding from 7:00 am on June 29, 2014. All tourists can enjoy half-price tickets. That was less than 12 hours after it issued a "suspension" notice. Some media said that the closure of the Mount Emei Scenic Area was caused by the villagers' rights protection event, but the official denied this statement, saying that it was to investigate the safety risks in the flood season. At around 8 am on July 1, 2014 The parking lot of Wannian Temple gathered about 400 local peoples, mostly from nearby villages. Some villagers held up the banners, the reporter saw the contents of "Give us food to eat" and "Return villagers' forest rights certificate" In the past 7 days, every morning, villagers from more than ten villages such as Huangwan Township (Huangwanxiang) gathered at Wannian Township, Lianghekou and T-junction. On the evening of July 1, 2014 The Management Committee of Mount Emei Scenic Area issued a notice on solving specific problems of the masses in Mount Emei Scenic Area and issued a legally binding document. Most of local peoples are defending their rights in order to maintain their livelihood. In the Mount Emei Scenic Area, many local peoples make a living as guides, providing interpretation services for tourists by virtue of their "local advantages". With the Emeishan Municipal Government and the Scenic Area Management Committee establishing the Mount Emei Tourism Interpretation Service Company on the grounds of “unified management” and designating it as “the only legal interpretation service unit in the Mount Emei area”, the villagers’ self-promotional tour guide activities are prohibited. The recent dispute over Mount Emei is the result of policies that have deprived many local peoples of their main source of income. o There are 150,000 hectares of state-owned forest in Mount Emei Scenic Area, of which 120,000 hectares are obtained by returning farmland to forests in 16 villages in Huangwanxiang. o Local peoples not only planted trees, but also built roads and parking lots in Mount Emei Scenic Area. Yao Tengkai, one of the local people, said that when Deng Xiaoping came to Mount Emei in 1980, seeing people farming on hillsides was very hard. Then Deng Xiaoping proposed that tourism should be carried out so that people can eat well, drink well and have money. In 1981, Mount Emei began to return farmland to forests. At that time, the per capita cultivated land was three mu. The local peoples took out more than half and planted trees and the state distributed 350 grams of rice per mu of land; everyone has been receiving it until 1995. In 1981, when the returning farmland to forests began, Li Daqiang, the newly appointed director of the Mount Emei Administration Bureau, promised to distribute 3% of the ticket income to the local peoples and 2% to the villagers for working capital. In 1988, the scenic area began to sell tickets, and the local peoples received them according to the established proportion of dividends. But by the end of 1992, Li had moved away from the Mount Emei Administration Bureau, and Mount Emei Administration Bureau has renamed the Mount Emei Scenic Area Management Committee. When the local peoples went to collect money, the management committee rejected. Later, under the government's intervention, the Management Committee gave 400,000 yuan, saying that was used for construction. Until 1999, all the land in Wannian Village (a village in Huangwanxiang) was completed and returned to the forests. The ticket dividends were no longer able to be taken back to the local peoples. When the scenic spot began to sell tickets, the local people also participated in the management. However, the scenic spots slowly abandoned the people. For the villagers in remote areas, actively implement the socialist new rural construction project of “enriching the people by prospering the border”, and extract 3% of the annual ticket income as the special fund for the construction of new rural areas in the scenic spot. Supporting villagers in remote areas to create special industries, such as tea, bitter bamboo shoot planting, monkey and incense candle production, to help farmers increase their incomes. Starting from 2014, the Management Committee increased the special fund for the construction of new rural areas to 8% (from 3%), which would be used for special funds and pension subsidies for local peoples in scenic areas. On the night of June 30, local peoples in Huangwan township (Huangwanxiang) received text messages from the municipal government after an emergency meeting. The notice said that every year, the Mount Emei Scenic Area Management Committee would pay 3.5% of the ticket proceeds and pay dividends to the local peoples before December 31 each year according to the actual number of registered villagers in that year, each of whom shall be no less than 1,000 yuan per year. Since July 1, 2014, the Management Committee of Mount Emei Scenic Area has issued a pension allowance of 500 yuan per person per month from the current month for permanent villagers in the scenic area. Women who have reached the age of 55 and men who have reached the age of 60, enjoying lifelong benefits and the local government will raise the standard every five years according to the level of economic and social development. The issuance of the forest tenure certificate will be started from July 1; the employers in the scenic spot will give priority to the local peoples under the same conditions. The town is located at the entrance of Mount Emei Scenic Area. It covers an area of about 210,000 square meters and integrates eating, living, travelling, shopping and entertainment. The construction of Huangwan Martial Arts Culture Town is a beneficial attempt to avoid the damage to the ecological environment caused by tourism development. The construction of the town not only protects the ecological environment of the scenic spot and meets the tourism demand, but also improves the living conditions of local peoples, promotes employment, drives local economic development, and forms a good situation for the inheritance of heritage protection and tourism development. Built an international tourism and cultural town with the theme of Emei martial arts culture. Expand the tourism industry of Mount Emei Scenic Area. The designer makes the organic combination of mountain, water, landform and street highlight the characteristics of "mountain residence", reflecting the complementary relationship between farming culture and martial arts culture of Mount Emei. Huangwan Martial Arts Culture Town is expected to house more than 3,500 villagers, build 3,205 resettlement houses and 1,034 shops. o Contradiction between the life of local peoples -- Local peoples have become increasingly dependent on heritage sites. In order to restore the landscape, the residents gave up the traditional agricultural production and returned all the farmland to forest. Local residents can only obtain major benefits from tourism services, which makes the heritage site shouldering the responsibility of supporting local residents. o Tourist control remains difficult. Due to tourism market competition and interest division, the management of Mount Emei heritage site is still hard to reject the large influx of tourists. o Residents have great resistance to control. At present, the economic strength of the Mount Emei heritage site is not enough to bear the cost of relocation of local residents. It is even more difficult to solve the residents' subsequent livelihood problems independently, and the cost will increase with time. Before 1980, local peoples in Huangwanxiang has formal customary rights. Since 1981, local peoples began to retune the farmland to the forests, and the property in Mount Emei became the state property. Among them, between 1989 and 1991, although villagers did not have the right to manage their forests, they could receive dividends from the tourism industry and they all contribute to the development of local tourism. After 1999, the ticket dividends were no longer able to be taken back to the local peoples. The rights of local villagers have been denied and they have to make a living through tourism. Until June 2014, they have deprived the right to tourism, and the local peoples had to start to resist. On July 1, 2014, when the local government started issuing the forest tenure certificate to local peoples, local peoples got the formal customary rights again but still state property (local peoples can access the forest and obtain interest from tourism industry) and had priority rights to get the job. Forest Tenure Certificate in China. By World Bank Group. 2016. Gender-Dimensions of Collective Forest Tenure Reform in China. World Bank, Washington, DC. © World Bank. CC BY 3.0 IGO. The forest certificate issued by the government is a legal document confirming the ownership and use right of forests, trees and woodlands. The forest land and forest trees owned by the whole people (that is, owned by the state) are exercised by the State Council on behalf of the state, and the State Council is the owner of ownership. The state allocates state-owned forest land and trees for free or transfers them to enterprises, institutions, individuals or other organizations for compensation. Enterprises, institutions, individuals or other organizations are only the owners of the right to use the forest land and trees. Local people who engaged in agriculture. Although most of the local people are involved in Mount Emei's tourism industry, some older people, or those who do not have enough money, still choose to work in agriculture. Without a forest tenure certificate, they have no right to manage their forest and profit from it. Villagers in remote areas have also been affected to some extent. If they cannot develop agriculture and tourism in Mount Emei, they can only engage in some special economic industries, such as selling incense candles and bamboo baskets. But the benefits are not enough to support their families. Local people who are relying on tourism industry such as unemployed ‘guides’ and local investors. If they can no longer engage in tourism, they will lose their primary source of income on the premise of returning farmland to forests. Mount Emei Scenic Area Management Committee is the most direct management department. They rejected the villagers’ application for dividend on tickets and prohibited local people from profiting as tour guides. Planners of this scenic spot and Huangwanxiang, whose goal is to create a sustainable and stable tourist attraction and develop local cultural history. Mount Emei Tourism Interpretation Service Company -- the only legal interpretation service unit in the Mount Emei area. They don't want the local peoples to act as guides to compete for resources. Outside businessmen/ investors will bid on government projects to invest in Mount Emei. Building shops or companies can increase the employment rate of local peoples, but they don't really care about the lives of local peoples. Policy makers-- the People's Government of Sichuan Province, should innovate the performance evaluation system of eco-tourism management to improve the understanding of local officials on the expected benefits of eco-tourism management. And establish the supervision system for the Mount Emei Scenic Area Management Committee. The first is to innovate the multi-assessment subject, establish an eco-tourism management performance evaluation system led by the government, effectively participated by the public and transparent information, with special emphasis on the supervision role of the news media and network public opinion. The second is to integrate effectively into the existing political competition. The "opportunistic" behaviour of local government (Mount Emei Scenic Area Management Committee) officials under the limited term of office will be solved through the mechanism of ecological accountability and reward. Mount Emei Scenic Area Management Committee should coordinate with Emeishan Forestry Bureau to set up a tourism standardization committee, and issue a unified and detailed standard system of environmental protection, food hygiene, safety and fire protection, etc., so as to promote the popularization and improvement of rural tourism ecological management. Local peoples -- it is important to express the dissatisfaction clearly when problems arise and to respond to higher levels of government (the People's Government of Emeishan City/ Sichuan Province. In the process of rectification, the executive strength of the Mount Emei Scenic Area Management Committee should be supervised. ↑ 1.01.1 Zhang, S. (2014). "Villagers in Mount Emei approved the dividend scheme: Feel the government's sincerity". Beijing Times. ↑ Guo, H., & Chen, Y. (2014). "Villagers block the road in Mount Emei". ↑ 4.04.14.24.3 Wu, Y. (February 10, 2018). "Mount Emei constantly "carrying up"". Sichuan Daily. ↑ Mount Emei Scenic Area Management Committee. "主要职责 (Main duties)". 峨眉山风景区管委会( Mount Emei Scenic Area Management Committee). ↑ 6.06.1 Guo, H., & Chen, Y. (2014). "Villagers block the road in Mount Emei". People. ↑ 7.007.017.027.037.047.057.067.077.087.097.107.117.12 Zhang, S. (July 2, 2014). "Villagers in Mount Emei approved the dividend scheme: Feel the government's sincerity". Beijing Times. ↑ Yang, X. (July 2, 2014). "The development of scenic spots should not harm the interests of indigenous people". Guangming Daily. ↑ 9.09.19.29.39.4 Mount Emei Scenic Area Management Committee (March 15, 2007). "Emeishan-Leshan Giant Buddha World Culture and Natural Heritage White Paper". 峨眉山风景区管委会( Mount Emei Scenic Area Management Committee). ↑ 10.010.110.2 Town Dynamics (April 25, 2018). "Create a martial arts town in Huangwanxiang, Mount Emei". 前瞻产品研究院 (Preview Industrial Research Institute). ↑ 11.011.111.211.3 Luo, H. (2007). "Research on the conservation plan of Mount Emei world culture relics—take the master plan of Mount Emei Scenic Area as an example". Planners. 3(23): 41–44. ↑ "什么是林权证？林权证的法律地位是什么? (What is a forest tenure certificate? What is the legal status of the forest tenure certificate?)". www.forestry.gov.cn. ↑ "林权证 (Forest Tenure Certificate)". Baike Baidu. This conservation resource was created by Jessie Wen. It has been viewed over 0 times. It is shared under a CC-BY 4.0 International License.